A University of New Brunswick engineering professor has been saluted nationally for his work in improving the safety of roads and highways. 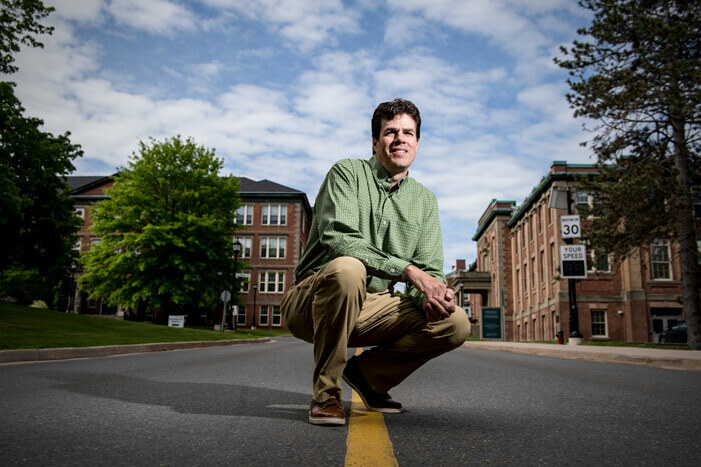 Dr. Eric Hildebrand, a professor of civil engineering at UNB and the co-ordinator of UNB’s Transportation Group, has received the prestigious Sir Sandford Fleming Award from the Canadian Society for Civil Engineering for his work across the country improving transportation safety. Alongside Dr. Hildebrand, two of his colleagues – UNB civil engineering professors Peter Bischoff and Jeff Rankin – were also in the spotlight at the recent society conference, recognized for their work and commitment. “I couldn’t be more pleased for Eric, Peter and Jeff – this is outstanding recognition for their incredible talent, passion and dedication,” says Chris Diduch, dean of engineering at the University of New Brunswick. Dr. Hildebrand has been passionate about improving safety in transportation over his three-decade career with UNB – acting as an adviser and investigator to Transport Canada on collision investigations as well as working closely with provincial governments and private contractors on highway design and safety. Much of his work has centred on the growing demographic of senior drivers. The accolades come at a time when road safety issues in society today are dominated by the aging driver demographic and the onset of self-driving vehicles. Dr. Hildebrand says autonomous vehicles present an opportunity for increased transportation safety. He believes self-driving vehicles could quadruple roadway capacity – saving governments billions of dollars in new highway construction costs. He’s modest about the recognition. The Canadian Society for Civil Engineering annual conference was held in Vancouver from May 31 to June 3. Dr. Bischoff was named a fellow of the society at the conference. Dr. Bischoff’s tireless work and extensive research in the field of civil engineering has earned him this prestigious title. Dr. Rankin earned the James A. Vance award – recognition is given to members who are dedicated to the advancement of the society. Over his career, Dr. Rankin has served various roles with the society such as vice-president technical divisions and committees, chair of the construction division, vice-president Atlantic region and four terms as a member of the national management committee and board of directors.